The Poison Spyder JK TrailGate™ replaces the Jeep JK’s heavy, cumbersome swing-out tailgate with a lightweight, sleek, aluminum drop-down tailgate. 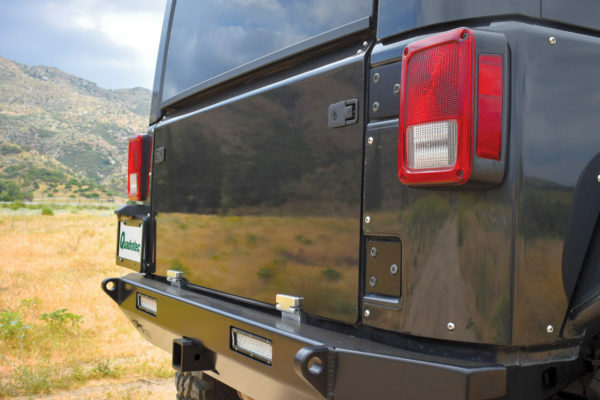 TrailGate™ restores classic “tailgating” functionality to the Jeep. It can even be used as a convenient seat at outdoor events, or as a lunch prep table for those stops along the trail. It also works great as a temporary work bench for performing those on-site trail repairs. The TrailGate™’s smooth exterior surface gives the back of the Jeep a clean appearance, which looks great on its own and even better when used in conjunction with a set of Poison Spyder Crusher Corners™. The gate panel s CNC laser-cut and precision brake-formed from a 3/16″ aluminum plate. The complete TrailGate™ kit includes CNC machined billet aluminum heavy duty hinges, locking flush-mount latches, limiting cables, brackets, weatherstrips, stock tailgate hinge delete plates, and hardware. The TrailGate™ can be paint matched or powdercoated prior to installation for an additional fee, please contact us for pricing and availability. Coastline Motorsport is an official dealer and installer of Poison Spyder products. No matter how high your standards are… theirs is higher. Based out of the Bay Area, MAcarbon produces interior carbon fiber pieces with quality that is unsurpassed. Since their start nearly 15 years ago, the company has expanded greatly from its start of manufacturing interior parts for Ferrari’s. MAcarbon now fabricates carbon fiber interiors for Audis, Lamborghinis, McLarens, Mercedes, Porsche, and of course Ferraris. Yes, there are hundreds of companies that sell carbon fiber parts. What’s the difference with MAcarbon? As many companies that exist selling carbon fiber, the number of suppliers are much more limited. That means multiple companies are selling the same product with the same quality, and unfortunately, carbon fiber has made its way into the mass production market. Some parts may seem like a great deal, however fitment and quality are commonly sacrificed. All of MAcarbon’s product is made in-house, with suppliers in Belgium and Montreal. As most of their products are made per order, they follow the manufacturing process from beginning to end to ensure the highest quality carbon fiber parts that meets or exceeds OEM carbon. MAcarbon utilizes two types of processes to fabricate their pieces, molding and lamination. The molded carbon process is utilized for making parts like ashtrays, shift paddles, surrounds, and more. Because parts are manufactured in-house, MAcarbon is able to produce pieces that aren’t available anywhere else on the market. The lamination process allows for carbon fiber parts to be made that wouldn’t be poss ible with molding. Parts like steering wheels, center consoles, air vents, panels, door pieces, and more are available, making MAcarbon the first company on the market to produce a true, full, carbon fiber interior. How much carbon fiber would you like in your interior? What would it look like installed? Coastline Motorsport is an official dealer and installer of MAcarbon products. Come by our showroom and check out MAcarbon’s interior configurator that was made specifically for their products. You can select your vehicle and the parts you want to see in carbon fiber. You can also use the steering wheel configuator, where you can pick and choose which options you like best for your fifth wheel. For pricing and scheduling, please contact us at (818) 222-8881 or email us at questions@coastlinemotorsport.com. Help eliminate those blind spots! By 2018, the National Highway Traffic Safety Administration will require all new vehicles to come equipped with “rear visibility technology” to help reduce the number of deaths and injuries caused by backup accidents. Most new vehicles currently come standard with parking sensors, however, sometimes, the backup camera quality could use some improvement. In addition, getting a camera from the factory often required buyers to purchase package options with accessories and features they did not need. Thankfully, we have a solution for you. Coastline Motorsport has been a dealer and installer of Nav-TV products since 2014. Nav-TV offers camera integration with your pick-up truck’s current radio screen, such as IOB screens, MyFord Touch/Sync, Uconnect. Rear tailgate handle cameras are offered for Chevrolet, Dodge, Ford, and GMC trucks, which works with your specific vehicle application so it looks like it was installed straight from the factory. The F-Series Ford trucks from 2009-2014 have the option of using a rear blue oval Ford Logo style backup camera. Most backup camera packages offer the option of having guidelines to better assist with distance and direction. In addition to backup cameras, Nav-TV also offers navigation cameras, so you can see what’s going on around your vehicle. According to the NHTSA, over 15,000 accidents occur every year due to lack of visibility around vehicles, with a majority involving children and seniors. Many clients enjoy having the side and front view cameras to help reduce the possibility of these incidences, and enjoy having the ability to activate the cameras as needed. An additional option for pick-up trucks, Nav-TV has cargo cameras embedded into 3rd brake lights. Cargo cameras allow you to view the bed of your truck for added safety and security. 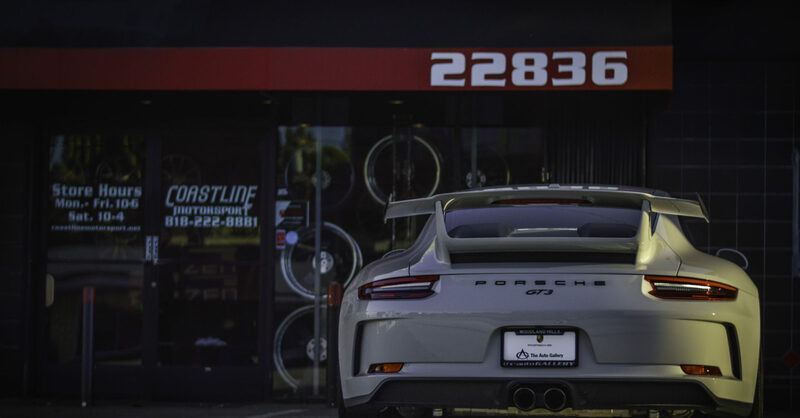 For any further questions regarding vehicle application and pricing, please contact us through email (questions@coastlinemotorsport.com) or contact our Woodland Hills showroom directly (818)222-8881. The Audi R8 is arguably one of the worlds most recognized and beloved supercars. From the high revving V10 to the renowned Audi Quattro-AWD system, this vehicle embodies the word “supercar”. But what happens when all of that isn’t quite enough? The Prior Design PD800WB brings Tony Stark’s wildest dreams to life. A full widebody package, with front bumper, front lip, vented hood, side skirts, fenders, rear bumper, diffusor, and more to maximize downforce. From one of the most innovative supercar manufacturers to date, comes an earth shaking, record shattering, and head turning ride: Boasting a twin-turbocharged 562HP V8 engine, attached to a lightning quick 7 speed Dual Clutch transmission, supercar is propelled to 60 miles an hour in a head spinning 2.9 seconds. So, could it get any better? Prior Deisgn thinks so. That’s why the PD1 Full Carbon Aero kit was created. This aerodynamic package gives the already stunning McLaren 570 an even more commanding road presence, and significantly improves handling as well as downforce. This vehicle is also equipped with our PD3 3 piece, Superlight Forged wheels. 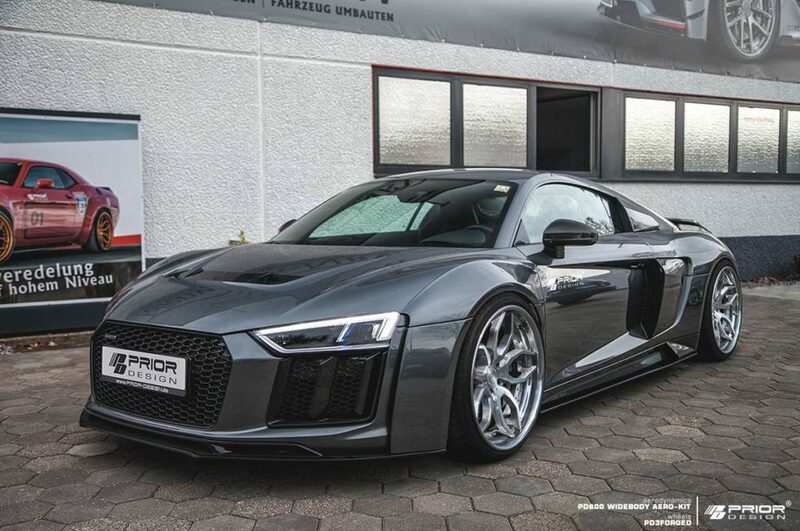 Be sure to check out other body kits available from Prior Design. 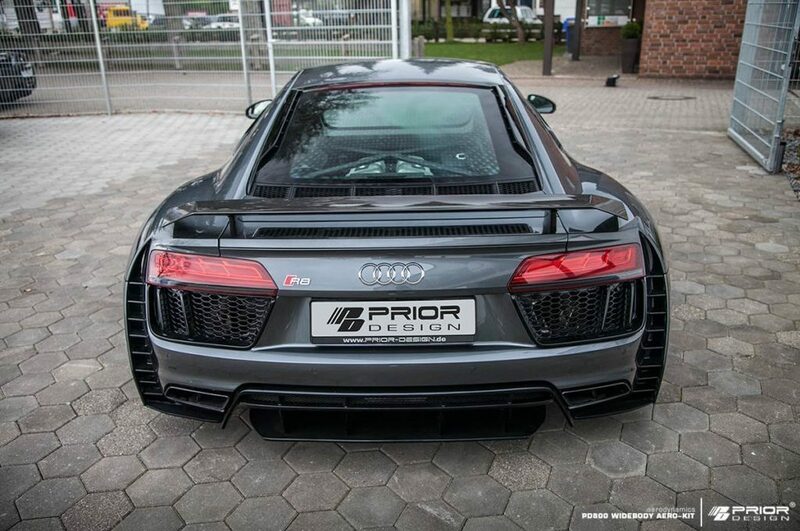 Coastline Motorsport is an official dealer and installer of Prior Design products. The Petersen Automotive Museum glistened during sunset on June 24th as a crowd gathered into the Bruce Meyer Family Gallery. Among the crowd was Magnus Walker, the director of the film Roger Donaldson, Bruce Meyer himself, and members of the press. A theater had been set up in the middle of the room surrounded by gorgeous landmark Ferrari’s, like Niki Lauda’s Monaco car, LeMans cars, GT cars, and a La Ferrari. However, we were all here celebrating a different legacy. 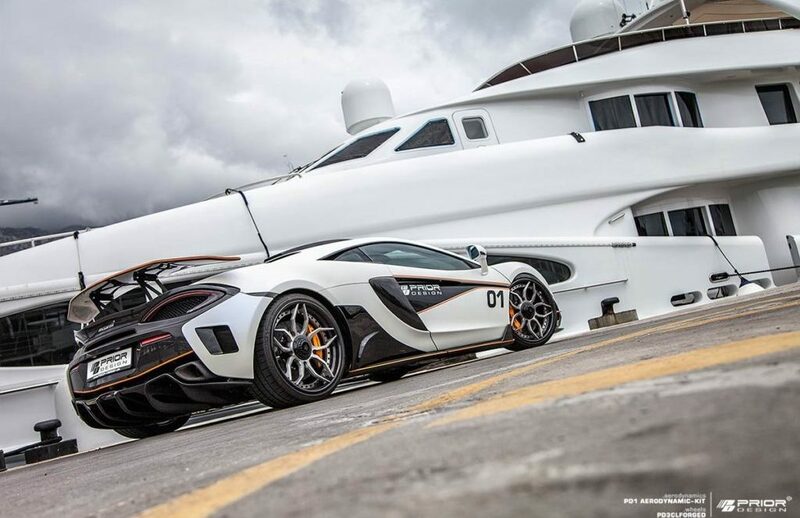 What most people know about McLaren is that it is an English automotive company named after Bruce McLaren, with a passion for unadulterated performance. However, not many know about the true origins of the company. This is what helped drive director Donaldson to make the documentary McLaren. The film goes through Bruce McLaren’s life from an early age, where he grew up in New Zealand in a wrench-turning household. Bruce would help his father at the family’s automotive shop, but he would also help build karts and cars to compete in races with. He had issues with mobility growing up, but it never stopped him from his passion of tinkering with cars and being behind the wheel. During the 1930’s and 40’s, New Zealand was more remote, so parts for vehicles were harder to come by. As a result, there was a lot of experimentation and originality in builds. Early on, Bruce was a competitive driver and eventually moved onto the local Grand Prix races. His skills behind the wheel along with his automotive knowledge stood out to John Cooper, who hired him on. Bruce was involved with the cars both behind the wheel and under the hood. Having access to proper parts and a track, McLaren’s racing career really took off. The film features video and audio clips of McLaren’s early competing races and the development of his cars. Motorsport legends such as Mario Andretti, Emerson Fittipaldi, Alastair Caldwell, and others are featured in the documentary. They spoke about the true passion and thirst Bruce had for motorsport performance along with the dangers of racing back before safety regulations. Loss of life was not unusual on the track, but looking death in the face didn’t stop these competing drivers. As his wins started adding up, Bruce wanted to leave a mark on his builds. His logo included the kiwi bird, which is the national symbol of New Zealand, and also the nickname of the citizens. After leaving Cooper in 63, he went on to form the Bruce McLaren Motor Racing Team. The story continues with Bruce getting his racing team off the ground, and how he built it up. He never wanted to borrow money, and drove for companies to fund the team. Watching the development of McLaren’s career is awe-inspiring. The man was a sheer genius, both on and off the track. Every vehicle he drove was tested on the track until it was perfect, and he was still hand on with each car before racing. However, while testing one of the Can-Am cars (the brother to the one pictured) he was involved in a fatal accident at the age of 32. The team wanted to carry on his legacy, so they continued to race and build the company into the McLaren Automotive we know today. During the Q&A following the film, fellow New Zealander Donaldson explained how he got the ability to make the documentary. He was working on his second film project looking for a special car, when he met Bruce McLaren’s father. The McLaren family had plenty of video and audio clips from Bruce’s life, and after two years, Donaldson obtained enough footage to be able to create the film. It’s an incredible documentary, and the footage shows the kind of man Bruce McLaren truly was. Donaldson wanted to tell his story, a proud New Zealander, father, husband, driver, and Motorsport revolutionary.